Farmersgirl Kitchen: The Great British Bake Off - Farmersgirl Bakes! No, I'm not a contestant in the Great British Bake Off. I am sure I would crack under the pressure and probably swear, maybe even throw my cake at Paul Hollywood and tip my macaroons into Mary Berry's lap. Well, maybe I exaggerate a little, but I bake best when I have the kitchen to myself, some good music playing and permission to deviate from the recipe on a whim! I have, however, given in and bought the book. I got it yesterday in Tesco for a tenner, I used my points vouchers which makes it feel like it cost nothing at all - result! I thought I would honour the final of GBBO which will be shown on Tuesday 4th October by baking something from the book. I needed to make something for the Macmillan Cancer coffee morning we are having at work, it's not till Thursday so it had to be a biscuit that I could put in an airtight tin to keep. 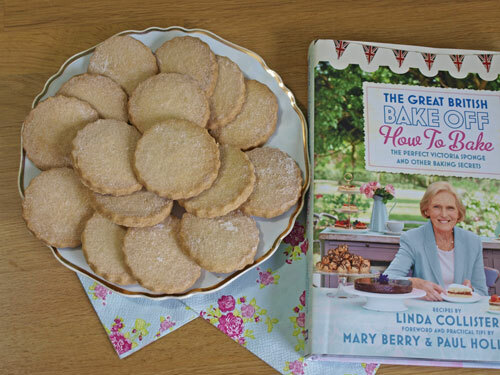 I was taken with the shortbread recipe, which uses cornflour or rice flour as well as plain wheat flour. I didn't have any rice flour but plenty of cornflour. The recipe is for Ginger Shortbread, but I have left out the ginger because I didn't have any crystalised ginger so I just made it plain. I make shortbread every Christmas with THIS recipe, which works well. It was interesting to see how a different recipe worked. I will try the variations from the GBBO book another time. The biscuits were easy to make and baked very evenly. Looking forward to trying more recipes from the book. Good Luck to Holly, Jo and Mary Ann in the Final of the Great British Bake Off. You have given us some fabulous bakes, some nail biting moments and it will be strange not to join you all on a Tuesday evening. 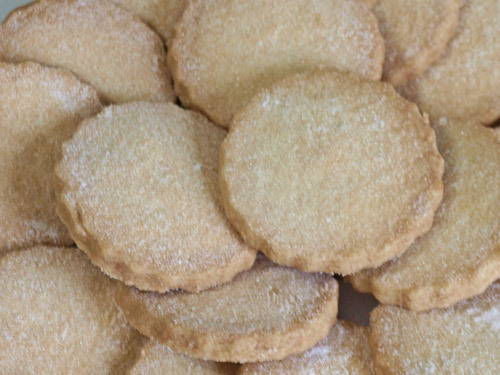 They are pretty little shortbread cookies (biscuits). I am sure they will be much enjoyed by the people you share them with at work! Shortbread biscuits are a favourite of mine Janice and those look perfect....I always make some every Christmas and Hogmanay and use my wooden boards to get the patterns.....love them! That's strange I wrote a post on this book today - not posted it yet though! Ultimately, shortbread is the best biscuit I reckon and yours look lovley. Bet they taste good with or without the ginger. Your blog post made me smile, as I've seen the book making its way into the homes of many bloggers this week (and in times mine too I'm sure of it). I like how you got it with your points. Thats a thought for me consider, but I don't know if my husband will let me; or if that overdue bottle of red wine is next on our treats list. I have to agree with LDH they are certainly pretty shortbreads. I recently saw a shortbread recipe which uses rice flour and I wondered what it ended up like. You've convinced me to try it. They look like they came out of a very fancy box! And so much better without the Ginger. It is sad the series is coming to an end soon. They look great! I've really enjoyed the GBBO and am very sad it's over now, but have been enjoying the book too, so at least I've still got that to enjoy! I am going to miss the GBBO, much better than Master Chef, which I also enjoy. I didn't bake at all until I was sent a copy of the book and highly recommend it. The Shortbread cookies look really tasty.